This tuna steak recipe couldn’t get any easier! 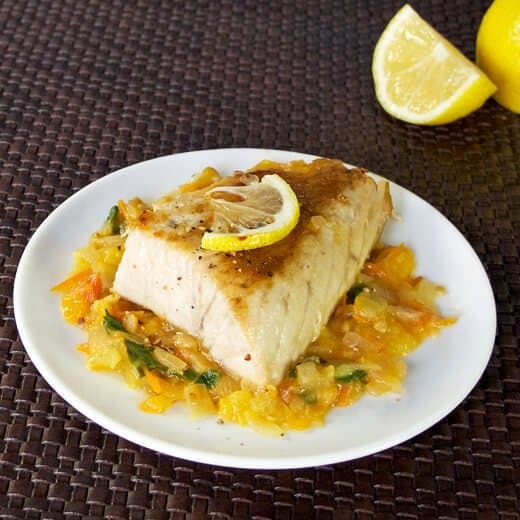 Paired with a sweet and savory quick tomato relish, this is a healthy meal that will please your whole family. This tuna recipe is very filling but still remains a low calories and low fat meal, therefore ideal for dieting. Serve this tuna with quick tomato relish with a glass of white wine, , a side of broccoli and cauliflower gratin, stuffed peppers or some baked mushrooms. In a pan over high heat, add 2 tbsp olive oil, garlic and onions, and cook for 3-4 minutes, until onions are translucent. Add tomatoes and sugar, and cook for 5 minutes, or until the mixture is almost like a sauce. Turn off the heat, add basil and season with salt, and pepper. Use a separate pan to cook the tuna. Season the tuna with salt and pepper on both sides. Wait until the pan is hot and add the remaining 1 tbsp olive oil. Add tuna steaks and lower the heat to medium/high. Cover and cook until well done (about 7 minutes). Covering the pan keeps the fish moist, I use this trick for fish, chicken and even meat; it works like a charm. This is totally worth the lack of effort it takes to make! I had some hamachi tuna hanging around that I wanted to do more than just salt-pepper-sear, and when I saw this, I realized I had all the ingredients hanging around already! It tastes better than a restaurant and god serious bonus points for being one of the quickest “fancy” dinners I’ve ever made. I will make this again and again and again. Don’t get me wrong here – I like tuna as much as the next guy. I’m just thinking of experimenting with beef or lamb for this recipe, if you don’t mind. I love tuna dishes and I guess this is a great entree to present to our wedding’s catering service. Thanks a lot, you’re a life-saver! If there’s one thing I like about going to big social events in Sydney is that they serve really great fish dishes. I remember this one time when I went to a catering company sydney office in order to have a crash course in cooking but I think I’m too much of an amateur to understand the complex preparations. Good thing I found this on the web. Many thanks! I’ve always been intimidated by cooking fish…my daughter served a fantastic tuna steak dinner not long ago for her husband’s birthday. Your recipe looks delightful…I need to try it! Thanks!